*NOTE: Scroll to the bottom of this page to see all of the artwork this post refers to. 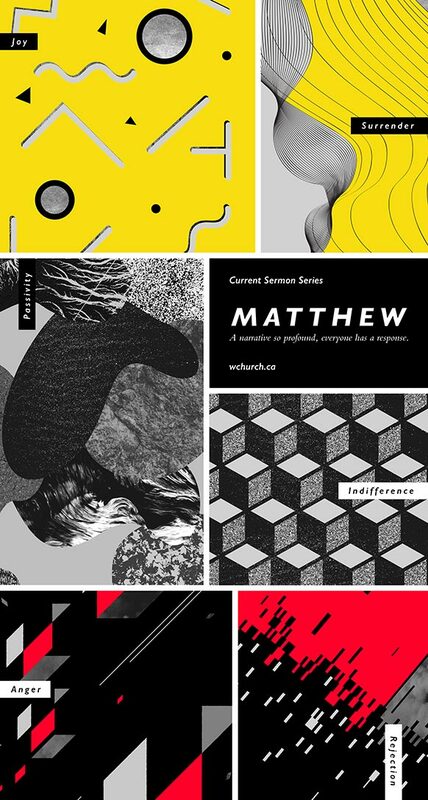 The book of Matthew is all about the response people have when confronted with who Jesus is. Everyone who encounters Jesus in the book of Matthew responds to him in various ways, but here’s the key, everyone does respond. Whether it be with anger and rejection, passivity and indifference or joy and surrender, the narrative of Jesus is so profound and compelling that everyone reacts in one of these ways even if it’s only on a subconscious level. This is still true of us today in our response to Jesus. In the same way that we have a response to Jesus and the radical message that he came to bring, we also respond to visual art. Visual art makes us feel things through colours, shapes and textures. Even if you don’t consider yourself an artist or you don’t “get” art, you have a natural reaction to it whether you’re aware of it or not. You may see a piece of art and feel joy even if you are never be able to explain why you feel it. This is what abstract art is all about; communicating feelings and provoking an emotional response in the viewer. So what words would you use to describe anger? Maybe sharp, jagged, forceful, losing control, violent, burning, etc. 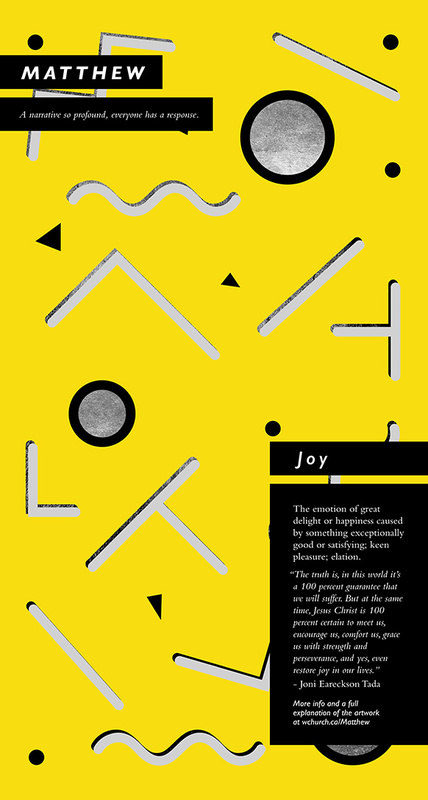 What about joy? Maybe bright, energetic, fun, celebratory, etc. You get the idea. So if we take those words and to try to evoke them in an abstract way it would make sense to use shapes, textures and colours that reflect them. The gospel can be wildly offensive to those who don’t believe in Christ. The message that Jesus brought was, and is, entirely counter-cultural. It draws a hard line on what is right and wrong and how we were originally created to conduct our lives before sin entered the world. The response of many to that message is anger. It grates up against our human want to control our own lives and decide what is best for ourselves. Anger and rejection go hand in hand. Those who find the gospel offensive often choose to reject it. If Jesus actually is who he said he was, then according to the Bible, one who rejects Jesus, rejects God and separation from Him is the result. 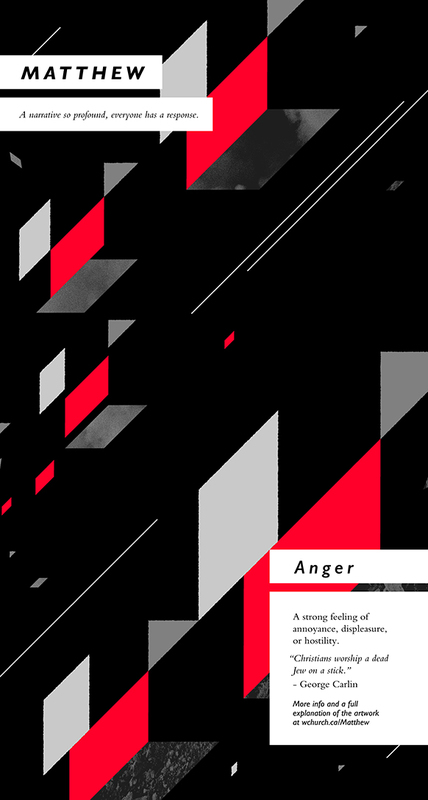 In the anger piece, all the shapes are sharp and jagged, communicating the sharp and raw aspects of anger. 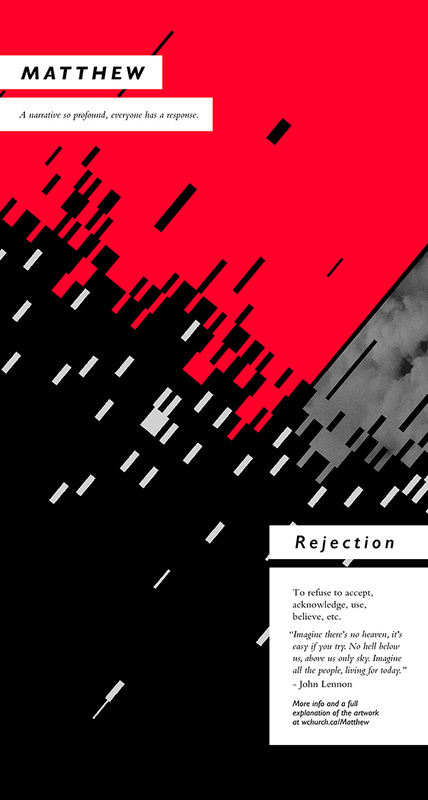 In the rejection piece, the red and the back areas are made up of particles or rectangles that are separating from each other, reflecting the separation from God that happens when one rejects Jesus. In both pieces, the red contrasted against the black background creates tension and an unsettled feeling of animosity. The colour red is most often related to the emotion of anger, but it also expresses the violence of the reality of being separated from God. The movement of the elements upward on an angle expresses the force of both of these responses. Indifference and passivity speak of those outside of the church and also those inside of it, but let’s focus on the indifference and passivity that many have toward Jesus inside of the church. The Bible warns against being a lukewarm Christian quite sternly, yet this is often the reaction to Jesus that we see in the North American Church. I know your works: you are neither cold nor hot. Would that you were either cold or hot! So, because you are lukewarm, and neither hot nor cold, I will spit you out of my mouth. For you say, I am rich, I have prospered, and I need nothing, not realizing that you are wretched, pitiable, poor, blind, and naked. See also Matthew 7:15-27, 2 Timothy 4:3-4, Mark 4:15-19, Isaiah 29:13, and Matthew 23:25-28. In comfort, some are lulled into a state of apathy toward Jesus and the message of the gospel. Often those who would claim Jesus’ name do not live lives that reflect Him at all; in fact, their lives show no more compassion, conviction or moral uprightness than those who reject Jesus altogether. This kind of indifference to the message of Christ leads to passivity in living out the gospel that Jesus died and rose to give us. So what do indifference and passivity look like visually? They look colourless, lifeless and uninspiring. 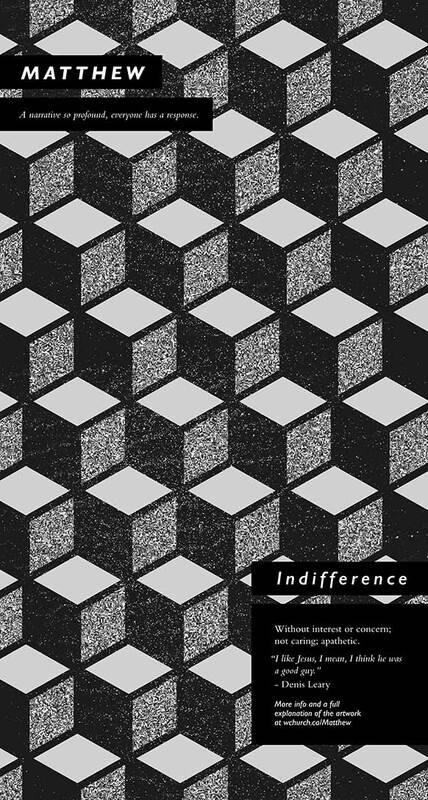 Like the repeated pattern of the cubes, indifference is repetitive, dull and fruitless. 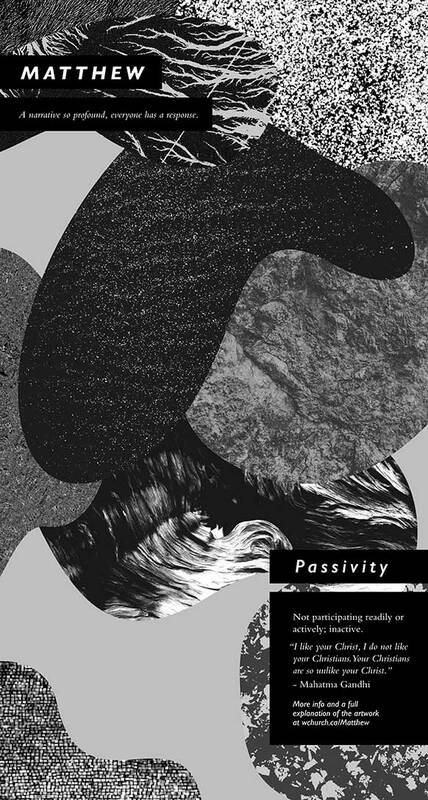 The elements of the pattern that speak to the idea of passivity are shapeless and fluid. They have no solidarity, but instead, they reflect how passivity takes a stand in nothing at all. It neither accepts nor rejects, it just goes with the flow of whatever current it finds itself in. The variety of textures in the passivity piece also convey the idea of not really being rooted in anything specific. To those who hear the message of the gospel and believe, it’s good news! GREAT news in fact! When one’s response is to surrender their life to Christ they gain everything and with that comes great joy, even in the face of suffering. When someone surrenders to God they take their hands off their life. They submit to God’s authority and his perfect plan for their life, even when they may not see how his plan is best. In Christ, they no longer need to carry shame or guilt, because that’s exactly what Jesus died and rose to pay for. Instead, they can draw near to the throne of grace with confidence. They are unconditionally loved and will never be abandoned and in this truth great joy is found. When we think of joy we think of celebrating! The piece that conveys joy is almost like bits of confetti that have energy and movement, because joy makes us come alive. When we see yellow we think of sunlight and warmth. 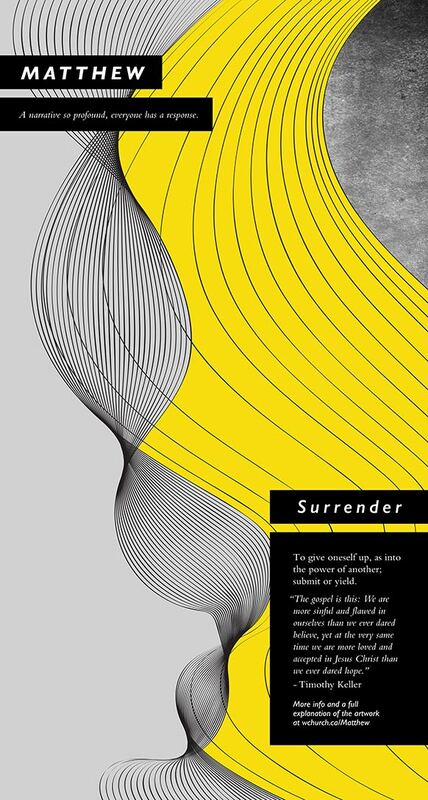 The surrender piece makes use of organic, sweeping, wavy lines that convey the idea of letting go and giving God control. They are reminiscent of water, which gives a feeling of renewal and comfort. Tiffany Haines is on staff at Westside Church as a graphic designer and also works with the music ministry.